Galapagos Ecological Airport was the first in the Latin America & the Caribbean region to reach Level 3+ Neutrality of Airport Carbon Accreditation. We had the pleasure of exchanging ideas with Jorge Rosillo, General Manager of the Airport. Thank you for taking the time out of your busy schedule to have this chat with us. We are big fans of your social media communications, which speak a lot about the flora and fauna of the Galápagos Islands and about the many actions undertaken by the staff of Galápagos Ecological Airport. Could you tell us a bit more about the source of your passion for the environment? Is it a general feature of the culture of Galápagos? The whole Galápagos Islands are actually a one big natural park, governed by very strong environmental rules implemented by the Parque Nacional de Galápagos, the first national park established in Ecuador and a UNESCO World Heritage Site. With such a rich natural reserve as backdrop, people naturally become more conscious about the impact they have on the wellbeing of their surroundings. The airport is one of the most important sources of jobs and wealth on the islands, as tourism is by far the largest contributor to the economy. However, there is an important codependence that we need to account for. The tourists come to take pleasure in the wild flora and fauna of Galápagos, but their presence might also add to its detriment. Recognising our role as a vital part of the economy, we also need to act responsibly towards the preservation of the ecosystem. It’s in our best interest, because we want future generations to be able to visit the Islands and marvel in their beauty as well. This is one of the drivers of our protective attitude towards the environment. To achieve this, we team up with the city of Santa Cruz and Parque Nacional de Galápagos, supporting their environmental initiatives. Every time the city organizes a special environmental action or even a social action, we get in touch with them and help them. We are very committed to making the life on the islands better. We have seen that the staff at your airport have been helping cleaning the beaches and helping preserve the ecosystem by replanting endemic plants. Could you tell us more about the Environment Team at your airport? The actual Environment Team is very small. Since the beginning of the project, we have been working with a counsellor to implement the environmental programme with regard to Parque Nacional de Galápagos. Since the airport is located in its purview, we need to comply with the many rules imposed by this authority. Building on that, only this year we decided to hire two more people just to follow the different programs that we participate in: Airport Carbon Accreditation, ISO, LEED, on top of our own environmental strategy, that we need to fulfill. Given the vast scope of engagement that these programs require, we needed extra resources to put some order in all of these dossiers. Besides, we also have social responsibility management that is working along with the Parque Nacional de Galápagos and with the community. We want our airport to be a part of the society and to work together with the people of Galapagos. However, it wouldn’t be too big of a stretch to say that the entire staff of the airport is a one big environmental team. There is a term here describing when people spontaneously organize themselves and start working besides their job duties on other initiatives – we call it minga (communal labor). Our employees are very proud of the ecological status that our airport has taken on and engage eagerly in these so-called mingas. In collaboration with the groups coming from Parque Nacional de Galápagos and the city of Santa Cruz, our staff is cleaning the beaches, and working on the restoration and preservation of the environment around the airport. It has become an integral part of the culture of our airport. I believe people are very proud to work for Galápagos Ecological Airport. Which of your many projects are you the most proud of? Oh, that’s hard to say, because there are so many! One project that comes to my mind is actually two-fold. We collaborate with Parque Nacional on reforestation of the island on which the airport is located, as well as on the reintroduction of the yellow iguana. This reptile had been very common around the island, but due to military activity it has nudged the verge of extinction. Working on this project is very satisfying, because you see the effects of your work almost directly. It’s sufficient to say that the yellow iguana is now back for good and the native plants started thriving again. Another accomplishment that is of big importance to me is our airport’s carbon neutrality, which we achieved as the first airport in the Latin America & Caribbean region.These are the two projects that make me the proudest at the moment. I saw the other day a photo of an owl visiting the airport. I was struck by how relaxed this beautiful bird was in such an unusual setting. This type of owl feeds on iguana, so that is actually one more proof of the big come-back of the aforementioned reptile. Animals are often tempted to visit our airport, as the absence of air-conditioning and its openness make it seem like a natural environment for them to peruse. But of course they can also be a hazard, so we do have to manage their presence on site to ensure they are not near the runway. Could you tell us a bit more about the history of the airport of Galápagos? Its history goes all the way back to the second World War, when Americans decided to put a military base in the area of the Galápagos Islands to protect the Panama canal. They chose Baltra island specifically to construct an airport here. Once the war was over, the military activity around the islands ceased as well. The government of Ecuador started managing the runway that was left behind. It slowly became one of the main touristic destinations in the region, especially after the 1980s. After having succeeded with the implementation of Guayaquil Airport, Corporación América gained more trust from the former president of Ecuador. In talks between the director of Corporación América and the government, Corporación America offered to build an ecological airport on the Galápagos Islands - one that would not contaminate and that would help to develop the tourist industry in a sustainable way. Both sides were happy to act upon this idea and agreed to establish a pilot project of building a sustainable airport. The old airport of the Island of Baltra was chosen as the experiment field for this new project. Corporación América went through the privatization process with the Civil Aviation Authority, resulting in a signed contract in 2011, to construct and operate an ecological airport in Galápagos. It was a long process then? Yeah, it was a very long process, because Ecuador had a lot of political and economic issues and the constitution changed in between, so in order to complete the privatization process we had to fulfill different legal aspects. We started the construction by the end of 2011. We had several conditions put on us by the government. For instance, the airport had to be recognized by an international agency for its ecological merits. We agreed that this organization would be the US Green Building Council. We started to develop a Leadership for Energy and Environmental Design (LEED) process alongside the construction. By the end of 2012 we were almost finished with the construction, and in 2013 the US Green Building Council awarded us with the Gold Level of the LEED certification. Five years on, the airport’s implementation has been a huge success and we are now participating in other environmental initiatives and standards as well, such as Airport Carbon Accreditation for example. You joined the programme in 2015 and have since then progressed significantly within the framework. 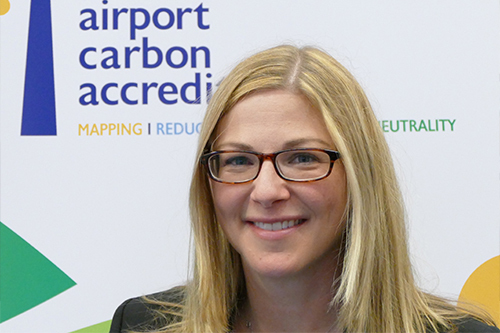 What are the main benefits of your participation in Airport Carbon Accreditation? There are of course many benefits, but if I were to name the most important to us, I would point to the learning opportunity it offers. We were the first airport, owned by Corporación América, to use recycled materials for construction, and then to valorize energy efficiency and to implement wind and solar power. It’s a learning process for our corporation and for our employees as well. Awareness of our energy and fuel consumption, mapping the sources of emissions and learning to reduce them, spreading the saving and recycling attitude among our employees and stakeholders are all achievements that we took on along with our participation in Airport Carbon Accreditation. But of course, in more general terms, the biggest benefit is achieving significant CO2 reductions, thanks to the comprehensive carbon management framework provided by the programme. You have recently upgraded to Level 3+ Neutrality as the first airport in Latin America & the Caribbean ever to reach this high in the Airport Carbon Accreditation programme. Could you tell me what where the main changes that you implemented in order to achieve this? In order to upgrade to Level 2, we reduced 25% of our energy usage. This was done principally by controlling the use of fuel for our vehicles and the energy consumption from the power generators that work on diesel. We also performed a switch from diesel to renewable energy, when three massive wind turbines were built right next to the airport. We saved a lot of energy thanks to them. That was the first control we did. And then, when we went from Level 2 to Level 3, we reduced our energy consumption by a further 10%. To achieve Level 3 Optimisation, we started working with the airport community: the ground services providers and the airlines, with further reductions in view. However, until we will have changed the equipment to electric options, there is not much left to curb. We are trying to control rigorously the use of the fuel-powered vehicles, but the switch to electric-powered vehicles is an investment that needs to be done in future. We also call on the authorities that work at the airport: immigration, Parque Nacional, the Police and also the Civil Aviation Authority to make sure they support the carbon reduction initiative of the administration at the airport. Our job is largely facilitated by the fact, that all our stakeholders also want to be a part of a carbon neutral airport. Our Neutrality status was secured through reducing our carbon footprint to the minimum possible in our current conditions and then purchasing offsets from a responsible source to compensate for the remaining residual emissions. So it’s been a very good experience this year, working with all the communities at the airport to accomplish that. I read that the airport is running solely on wind and solar generated power. Could you explain a bit more about the nature of your airport’s carbon footprint? Let me explain where do we get our energy from. 33% of our energy comes from our own solar panels. Two years ago the government of Ecuador funded three wind turbines in the direct vicinity of the airport, and we were the first ones to be connected to their energy output. That was more than enough to supply for the operations of the airport. Therefore, two years ago we started to operate on very clean energy. But besides that, we still have other sources of emissions. When, for some reason, the flow of the renewable energy is interrupted, we still have to ensure that the operations at the airport run smoothly. A fossil generator remains a guarantor of that. Another factor that adds to our carbon footprint is that the buses and cars at the airport run on diesel and gasoline. We are slowly moving towards the use of electrical cars. This year we purchased our first electric car to help with the operations at the airport and it was a success. We are also asking the airlines to use electrical equipment for their ground services. You mentioned that Galápagos Ecological Airport is a pilot project. Is Corporación América thinking about implementing some of these ideas at at other airports they own? Yes, we are definitely going to use what we have learned in Galápagos at other airports. In fact, the process of applying this knowledge has already taken off. For example, the airport of Guayaquil recently achieved Level 1 Mapping of Airport Carbon Accreditation, and the procedures to upgrade to Level 2 Reduction have already been put in place. Carrasco International Airport in Uruguay has also recently joined the programme. In terms of construction, the new parts of the airport of Brasilia will be built with more environmentally friendly materials. We have also noticed that, while all these green materials and renewable energy were expensive in 2011, when we started constructing Galápagos Ecological Airport, now they’ve become more affordable - the price has gone down even for solar panels! This decrease in cost of the new sustainable solutions is mostly due to the fact that more people are deciding to invest in them. It has become more accessible and more feasible to go green. This evolution paves the way for bigger airports to embrace the technology as well. It seems that you have learned a lot about carbon management and also about the ecological aspect of running an airport. If you were to give advice to a fictitious airport manager that wants to spur this culture change at their airport, what would you suggest? I would tell him/her: don’t create a separate Environment Department! (laughter) The environmental culture has to be developed across the board of the entire company. Every employee has to work in line with the administration’s environmental strategy. It doesn’t matter if they work for the marketing or commercial department of the airport. All these different departments have to be involved and evaluated for their environmental efforts. If you establish an Environment Department, it might end up being isolated. But if every part of the organization has to accomplish a goal related to sustainability, then you start creating a culture. That’s what we could observe at Galápagos Ecological Airport. Every part of the organization has to have this environmental aspect in mind and they need to be evaluated on the environmental awareness, but not an isolated department. That would be my recommendation, and I’m sure it’s a recipe for success. That’s really a great idea! Thank you very much for your time. Jorge Rosillo is General Manager at Galápagos Ecological Airport since 2010. The airport is owned by Corporación América, a holding group that owns now 53 airports across the world. Galápagos Ecological Airport joined the Airport Carbon Accreditation programme in 2015 at Level 1 Mapping. In 2017, the airport reached Level 3+ Neutrality as the first airport to boast such a big achievement in carbon management in the entire region of Latin America & the Caribbean.